Our reader asked us a question. I faced a strange issue on my Samsung Galaxy J3 phone. I took cool photos and wanted them to sync to Google cloud to be able to share images with my partner. Then I connected to the Wi-Fi network, opened the Google Photos app and waited. But images don’t begin uploading. I see the notification “Waiting for Wi-Fi. 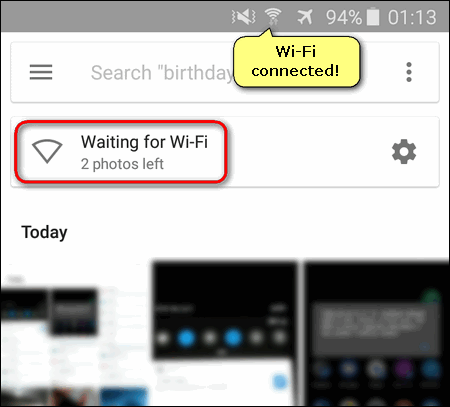 2 photos left” despite my Galaxy phone is already connected to Wi-Fi. There is another curious thing: I was outside and that’s why I was using another Android device in a Mobile Hotspot mode instead of connecting to an ordinary wireless router. Please, help me. How can I make my images won’t upload to the cloud? Thank you in advance.